In a back and forth affair in the Gavitt Tipoff Games, the DePaul Blue Demons came out on top with a 72-70 win overtime over the Penn State Nittany Lions. Here are my five things to take away from Wintrust Arena. The Blue Demons offense looked lethargic in the first 3:20 of the game, which led to the Nittany Lions scoring the first 11 points of the game. Penn State’s defense made Max Strus a non-factor as he did not get a single touch in that stretch. Enter Paul Reed and Femi Olujobi off the bench. Reed and Olujobi delivered instant energy in the post and gave the Blue Demons some identity with a combined 21 points. DePaul coach Dave Leitao wants to see the everyone in rotation contribute when the chips are down going forward. 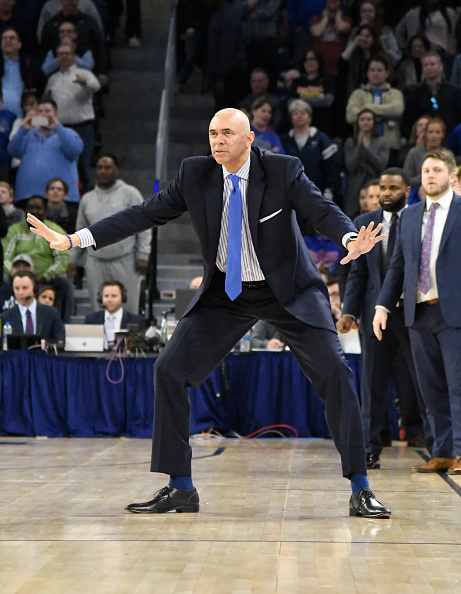 When coach Dave Leitao returned to DePaul for his second stint at DePaul in 2015, the process for taking steps back to relevance would be a long journey. While many steps need to be taken, the overtime win over Penn State gave DePaul its first 3-0 start since the 2008-09 season. After going almost the first four minutes without a touch, it would be a matter of when, not if DePaul leading scorer Max Strus would strike. The second half would be Strus’ calling card as he found his groove with a timely long range make to put DePaul ahead 52-50, which got the student section in a frenzy. Strus showed his ability to soar at the 9:24 mark in the second half with a dunk off a crisp alley oop pass from Eli Cain, which gave the Blue Demons their largest lead at 63-53. The senior finished with a team-high 21 points to go along with nine rebounds, but focused on being able to overcome late-game struggles to flourish in overtime. There is a reason why Penn State won the NIT last season and the resiliency showed in the final 3:41 as it scored the final 10 points in regulation to force overtime. The comeback came at a cost as the Nittany Lions went 0-of-6 in the extra session with the only points on a pair of free throws from Lamar Stevens. Nittany Lions coach Patrick Chambers admitted it was combination of fatigue and quality defense by the Blue Demons. Fresh off a 25-point, nine-rebound showing against Jacksonville State on Nov. 12, Stevens kept the momentum going with a double-double (25 points and 12 rebounds) in the loss. Despite his second double-double of the season, Chambers knows Stevens needs others to contribute in order for them to prosper.